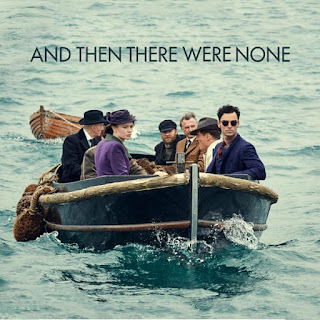 One Eternal Day: "A tangible sense of dread"
Tonight at 7:00 (CDT) Lifetime will have a new BBC TV dramatization of Agatha Christie's most successful book — "the best selling crime novel of all time" — originally published here as Ten Little Indians (1939) and soon thereafter as And Then There Were None. .... With twists and turns and double bluffs, it's a completely engrossing mystery. Ten people are invited to a party on an island. Ferried across the storm-tossed waves, they climb one by one to the mansion on the hill, establishing character by brief snippets of conversation. The bluff general. The effete dandy. The religious spinster. Fast-forward to dinner, and it becomes apparent that no one knows their host personally. Odd. But no matter, at least the food's good. Agatha Christie has an unfair reputation as a cozy novelist. In fact, she was very realistic about human frailty. Her stories bring violence to the center of ordinary life and show even the most respectable of people committing unspeakable crimes. Many adaptations of And Then There Were None attempt to soften its essential tragedy, offering up a happy, crowd-pleasing ending. This one, by focusing on the cost of death, on the weight of taking human life, may be more true to Dame Agatha's spirit than any campy Miss Marple flick and yet more moral than the brutal pulp fiction served up daily on our screens.